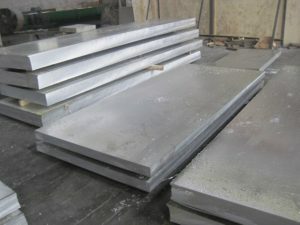 The main alloy element of 6061 aluminum plate is magnesium and silicon, with moderate intensity, good resistance to corrosion, excellent oxidation effect. 6062aluminum plate is widely used after heat treatment, for automated machinery parts, precision machining, all kinds of mold manufacturing. T6 state of 6061 aluminum alloy is the most used, forming process including medium thickness plate quenching, medium plate section, drawing machine, aging treatment, sewing machine, polishing, packing. The whole production cycle isabout 10 days. After heat treatment, It doesn’t need to be cold, but can be straightened, leveling,not affecting the mechanical properties. F state is freedom of 6061 aluminum alloy plate processing, applied to the process of forming, the strain hardening and heat treatment conditions of special products.F state production cycle is short: medium thickness plate section, sewing machine, polishing (also is not polished, according to customer’s requirement) – packaging, the entire process to arrange 3 days can be shipped smoothly. F state mechanical properties do not have strict specifications, customers according to their own needs can be heat treatment processing, the F state again the state into production use. Corresponding to the price is the cheapest. O state is to obtain the minimum strength of 6061 aluminum alloy after annealing completely processed products, applied to the 6061 aluminum alloy sheet under 8.0mm. Its production process: cold rolling thickness – bent proper cleaning – full annealing – fly shear piece of stretch bending pose (or out of the finished product) – packing warehousing and so on a series of production, production cycle after T6 state. This entry was posted in Aluminum Sheet and tagged 6061 aluminum alloy, 6061 aluminum alloy sheet, 6061 aluminum plate, 6062aluminum plate. Bookmark the permalink.